The most effectively targeted website for selling a B&B or guest house - or a property suitable for B&B use - is on BandBassociation.org. It is promoted from the Bed & Breakfast Association's homepage and from Bed & Breakfast News magazine, as well as from every one of the (over 100,000 a year) email newsletters sent by the Association to its members and registrants. 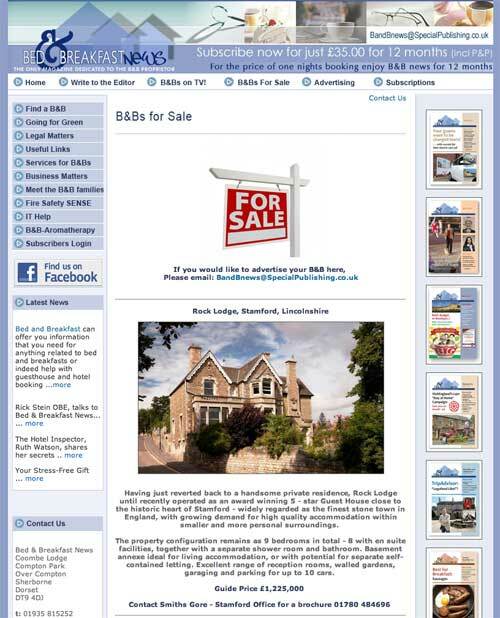 By advertising here, you can reach many thousands of B&B and guest house owners - and prospective owners - across the UK. Your audience includes experienced B&B owners looking to move to a new area, and those looking to buy or start their own B&B business. If you pay for 5 months, you get the 6th month FREE, so 6 months is only £75.00. An additional picture is an extra £5.00 per month (one picture is included). There is a 20% discount for members of the Bed & Breakfast Association. Our advertising rates are based on payment in advance of publication. Payment can be made by BACS, by credit or debit card, by PayPal, or by cheque - see our Payment page for details and to make instant online secure payment. For the full range of advertising opportunities in all our media, go to our Advertising page.